Hello! How old is my frame? Thank you! Hello! 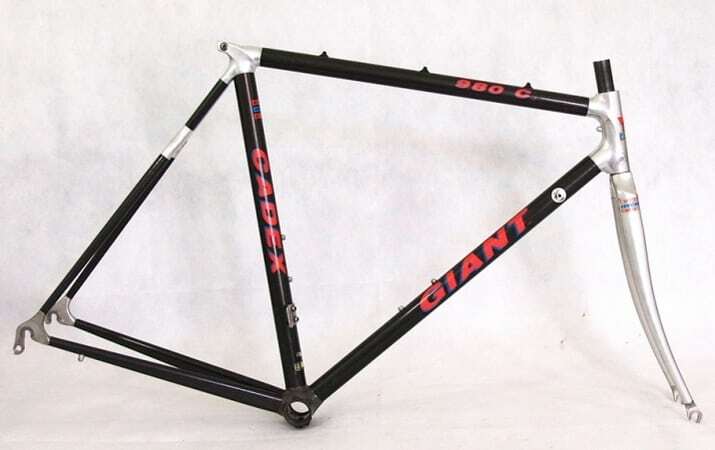 I recently bought this beautiful Giant Cadex 980C frameset..and i wonder how old it really is. Can you please help me figure it out? Thank you for your atention! Kind regards! Last edited by 3rg0; 07-20-17 at 08:03 AM. Looks Like late 1991 or 1992. ".... And in 92, the writing changed to silver with a red shadow + additional colourful shapes." We actually have an Unofficial Giant Cadex 980c Club. I have the 1992 Giant Cadex catalogue and the only road bicycles are the CFR series. The serial number indicates a frame manufactured during weeks 23-24 of 1989. However, the subject logo style wasn't introduced until the 1990 model year and it's not the 1990 version, based on a mini-review in Bicycling. The process of elimination would seem to indicate 1991 but then the serial number is incorrect. Last edited by T-Mar; 07-20-17 at 03:01 PM. But Giant didn't use the italicized, all upper case logo until the 1990 model year, at least in North America. Also, since my previous post, I've found a 1991 advertisement for the 980C and it's the same as the 1990 version. Right now, the only suggestions I have is that it is a foreign market model or the change in graphics was introduced part way through the 1991 model year. The serial number has one less numeral than standard and Giant typically used zeroes for placeholders, so I'm wondering if the stated serial number is incomplete. Thank you! I will join! Thank you for your interest. So the frame is older then i though..i guess one of the first carbon fiber that large public can have acces..
Thxs for posting your serial number. The components, if OEM, appear to be Shimano 105SC, which came out for the 1990 model year and are correct for a 1990-1991 Cadex 980C. However, it didn't get the STI upgrade until the 1993 model year. The components date codes may help shed some light. Your English is fine , better than some native speakers here . Nice looking Cadex you got, it should be a good project for a nice rider. If you are going to restore, or build it to your taste, please continue the post updates and pictures, for us to follow along. Where are you located, country that is, out of curiosity only? Hello! Thank you for your appreciation. Yes i will post work in progress. 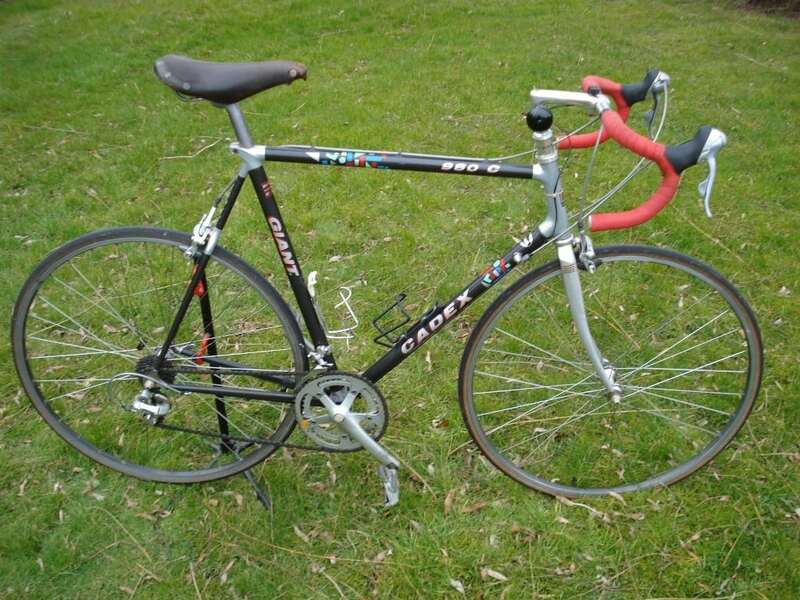 I feel like i'm going to buid it on my taste because i will use it for myself.Not for sale,not for collection.I'm a big F1 fan and a bicycles lover and building fast bikes feels like building an F1 car ). I'm from Romania..eastern Europe. Until now, I thought that the silver letters and "colorful shapes" came after the red letters w/ blue shade, like @Bertybert mentioned in post #5. But the more I look at bikes and serial numbers, the more I'm inclined to think it was the other way around. One detail that supports that is the head tube decal. 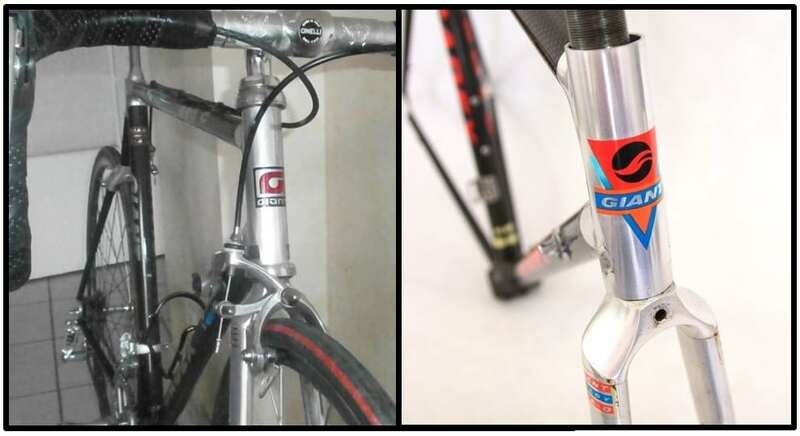 On these bikes it's still the old style "G", whereas the red-lettered 980C's got the later triangular head tube decal. Yes, the red lettered one would be weeks 15-16 of 1990, per the serial number. That passes the sanity check. Good point about the head badge. It mixes the old and new style graphics,so maybe the change occurred during the 1990 model year? I've also just noticed one other difference. Your frame and the OP's use a clamp style front derailleur whereas the the one with red decals uses a riveted hanger. Again, I'd assume the clamp style precedes the hanger. I just went back and looked at the 1990 mini-review and the 1991 advertisement. The 1991 definitely uses the riveted front derailleur hanger but unfortunately the resolution and picture size isn't adequate to say for sure on the 1990. Still, this seems to suppor the OP's & non-fixie's bicycles being early versions of the 980C. GL9xxxx serial numbers would be weeks 23-24 of 1989. This would be earlier than typical for 1990 model year manufacture, as indicated by 105SC components. However, according to the 1991 advertisement Giant actually manufactured the carbon fibre tubes in-house. This would increase the lead time substantially and they were likely building an stockpiling frames based on tubing availability. An examination of the date codes on non-fixie's 105SC components would quickly determine if this was the case. Currently, I'm leaning towards the OP's and non-fixies bicycles being early 1990 models built in in mid-1989. That would also explain the mixed graphics. Hang in there, Stefan! We'll get to the bottom of this. BTW, your thread made me realize how elegant these thin-tubed early CF bikes really are. Thanks for giving me a reason to get mine out of storage. Wow! I didn't realize that...very good eye for detail! This is getting interesting! Thank you so much! !